Home » Lifestyle » Campaigns » More than straight teeth.. I am one of those fairly confident people. I don’t get too hung up on my looks, even though I enjoy fashion and makeup, I don’t get stressed over clothing, even though I enjoy shopping, and pretty much no one has said anything to me in the past 10 years that has made me feel less of a person. I live by the mantra that the only person that can make you feel bad about who you are…is you! All of that said, even as a confident person, I lived pretty much my entire teenage-hood and half of my adulthood concerned about my teeth. They were far from perfect. A lifetime of coke, sweet tea, and no visits to the dentist, combined with being a preemie and not so perfect genetics, all weighed heavily on my enamel, gum line, and shape. To be blunt, my teeth were crooked and stained. It sorta sucked. Now as a teenager and college student I didn’t really have the ability to take care of it. I was operating on low to no funding and lets be realistic, when times are hard medical and detail go way out the window. But when I got married and I saw all my wedding photos included the typical “Trisha lip smile” instead of a bright white and straight smile I realized that I needed to start making a way to show the outside what was inside. I took the plunge and visited my local orthodontist, which at the time was in Charleston, SC, and he gave me a ton of information about braces, how long it would take to get my teeth in order, and the best thing of all, the health benefits of making the choice to get braces. At the time there were so many braces on the market. Invisilign was making its debut and it was promising these amazing retainer style removable braces so they were the first ones I asked about. My orthodontist said NO. He told me sure, you can get them but I will tell you right now that you WILL take them out and in your case, it will prolong your treatment. It was then that he introduced me to the Damon System. He promised that I would need NO teeth pulled like conventional braces, about a 2 year treatment plan, and even better, small braces that wouldn’t over take my mouth and make me feel self conscious. Today I am a changed woman. 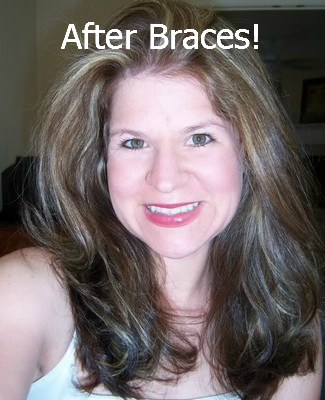 While braces were not the end of my teeth problems, they certainly were the beginning of a new me. And for the first time in my life I smiled, WITH TEETH, out loud and very proud. I know that so many people still suffer from dental problems but the truth is that they don’t need to. With my husband pushing me to do it, we decided nothing was more important than my health and finally created the time and money to get braces when I was 26 years old. Nowadays orthodontics have come so incredibly far and those Damon Braces I had? Over the next year I have been invited to be a Damon Diva. That means every few months I am going in introduce you to my personal treatments with my teeth, the power of a smile, how the Damon system works, and even visit an orthodontist to get his opinion. Does your smile need an upgrade? Last but not least, MomDot will be hosting a SMILE MAKEOVER contest (Courtesy of the Damon System) where YOU can get a life changing smile makeover. As a blogger, it has been one of my dreams to help women feel confident with what they do online, their families and who they are in a community sense, but as a person, being able to gift a smile to someone that may have never had one? It makes me ecstatic. So stay tuned and follow Damon System Braces and MomDot on facebook so you can learn more and find out why the Damon System is more than just straight teeth. Tell me…how do you feel about your teeth? *MomDot and Ormco are partnering the next year to bring you more information on how to change your life and the Damon System! I know what you mean about not being able to continue funding to take care of your teeth. I wish I had dental insurance or the money to fix my teeth. I hate the huge gap in the front teeth and the twisting and overlap of my front teeth now. It has caused me to have a speech impediment and a horrible smile. I have a medical problem that is causing lots of problems. I paid over $2000 to fix the problem and to have a good teeth. The dentist told me if I had any wisdom teeth come in or teeth pulled I would have to fix my TMJ again and now I have a swollen gland that needs to be biopsied too all because I had impacted wisdom teeth. They have caused me problems for 17 years. I need extensive work done on my teeth to stop them from getting worse and to stop the pain , headaches and speech impediment but I can’t afford it right now. Living on minimal income there is no money left for anything. Your smile is beautiful as mine once was (that is why I don’t change my profile picture). It was money well spent~!!! I drink way too much diet coke and coffee! As a child I went every 6 months but at 19 I had a bad experience with a dentist and haven’t been back since! I do my best to not put my fear onto my boys, they go every 6 months and my 7 year old just got a pallant expander put in. He has been amazing and I wish I had an ounce of his courage so I could go back in! its amazing once you get that courage. I found the right person and went and just said I was fearful and emabressed. He said the right words…its not as bad as you think. And I have been pretty good getting things fixed the past few years that I neglected. So much so that I went in 2 days ago and had ELECTIVE work done. I had some old silver fillings removed and pretty white ones put in the place. Trisha, I’ve always been told to fix my teeth I’d have to get the one that’s set way in back pulled, so I am very interested to read these posts. Love this post! Braces changed my life, but I have had issues with my teeth that make me self conscious. I know I need to do something about it because I need a fresh and healthy smile to get into the field I want to work in.